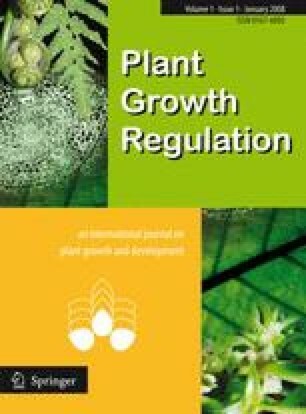 The effect of 28-homobrassinolide and 24-epibrassinolide on the germination and seedling growth of three varieties of sorghum, viz. CSH-14 and ICSV-745 (susceptible to water stress) and M-35-1 (resistant to water stress), under osmotic stress conditions was studied. Both the brassinosteroids were very effective in increasing the percentage of germination and seedling growth of all the three varieties of sorghum under osmotic stress, the growth promotion being associated with enhanced levels of soluble proteins and free proline. Brassinosteroid treatment enhanced the activity of catalase and reduced the activities of peroxidase and ascorbic acid oxidase.